Tomorrow is 4th of July and I'll make a safe bet you have a barbecue to go to and that there will be some hamburgers there. 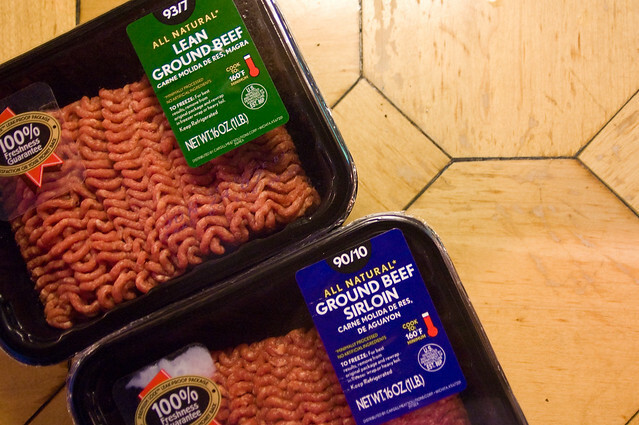 If the barbecue is your own, I expect that you'll be grinding your own meat, but what to do if it's not your own and you show up to find burgers are being made with lean ground beef, say a 93/7 (or even a 90/10) mix of meat to fat? You know this will result in dry burgers, but you also know that there probably isn't any beef or pork fat just laying around to add to the mix to fix the problem. There is a solution though, one that you should be able to whip up in a jiffy anywhere you go to save the masses from dry burger nastiness! This was almost the exact situation I found myself in last weekend. Kris and I headed up to Camp Daphne, for a weekend of relaxation deep in the hills of Woodstock. Every camp needs a cookout, and eyes pointed in my direction when it came to making the burgers. The food shopping was done before I arrived and I was given 2 packages of ground beef to work with, one 93/7 lean and the other 90/10 lean. I have a reputation to live up to as a Meatmaster, and cooking these packages of ground beef as is would surely lead to a dry burger, ruining not only me, but, more importantly, everyones' dinner. I needed fat, and I needed it then and there, so I looked to the one found almost universally, no matter where you are, butter. 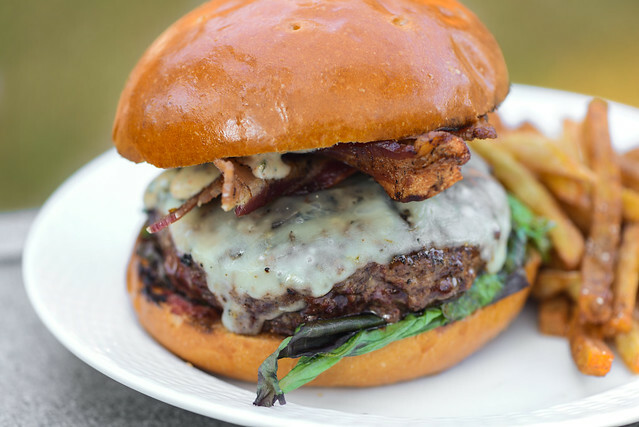 A good burger should be seared and crusty on the outside, while remaining juicy on the inside. 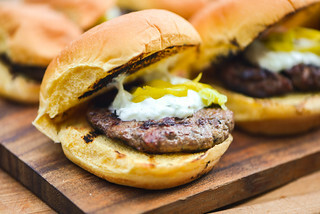 The problem with lean meat is that the inside will dry out way before you develop a nice outer crust, or, alternatively, if you pull the burger off the grill before it dries out, you'll be left with an ugly gray patty that will lack the depth of flavor and slight crunch that developing a good sear will give you. 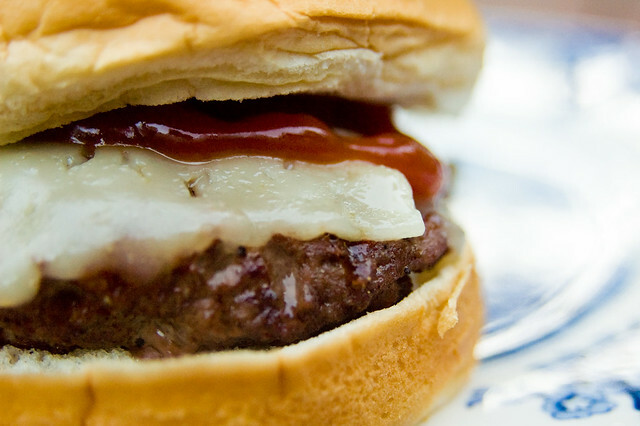 So the trick is to try to keep the burger moist while you grill the outside to perfection. This where the butter comes in, if you add a bit of butter into the middle of the patty, it'll melt as the burger cooks, keeping the insides nice and tender, allowing time to develop a crusty exterior. Butter is fine by itself, but I figured if it's going into the middle of the burger, might as well let it season it as well. I let 1/2 a stick of butter come to room temperature, then mixed in salt and pepper, rolled it into a log in plastic wrap, and put it in the freezer for about 10 mins to harden up again. You could added some extra spices or herbs here, but I personally think a burger should taste like beef, and find extra flavors mixed into the meat to be a little off putting. That's just me though, and I know lots of others who would disagree, so I won't stop you from going crazy. To get the butter into the burger, I first formed a patty, then made an indent in the middle to place about 1/2 a tablespoon of the compound butter into. With the butter in, I reworked the patty, forming it around the butter, then ended by putting a dimple in the middle of burger to keep it from shrinking on the grill. Then it was grilling time. The burgers went down over a very hot grill, which I find best with lean meat because it'll create a sear faster, before the insides start cooking too much. I could see the butter start to melt and seep through the meat just about the time they were ready to turn. Once flipped, the butter really started leaking through, but this was fine, since the butter was there to season and keep the meat moist, not to all stay inside the burger. By the time the burgers were ready to pull over the grill, they were all pretty close to well done, but with the added butter protection, that doesn't mean they were dry. The end result was a juicy, moist burger made from lean beef (of course I crushed any health benefits to buying lean in the first place, but burgers shouldn't be about health benefits). 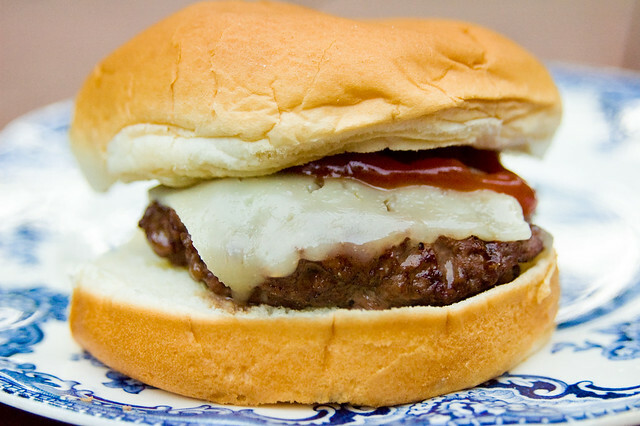 I have to say though, you will not achieve burger greatness with this butter burger. Even though I succeeded in generating a juicy burger, that juicy is not beef fat, and it lacks the deep meaty flavor that you'll get by grinding your own or purchasing fattier ground beef. I share this with you so you can be a hero, and save everyone tomorrow from the dry burger hell that I'm sure runs rampant on the 4th of July. 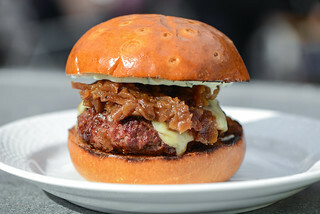 Our forefathers certainly did not fight for our Independence for us to consume dry burgers, so go make American proud. 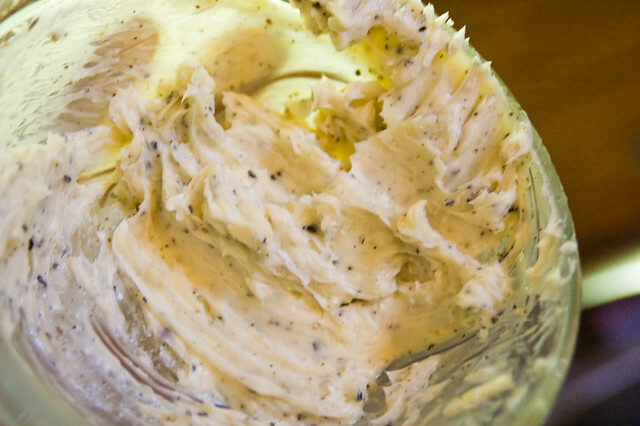 Bring butter to room temperature (or soften in the microwave) and mix in the salt and pepper. Spoon butter onto a piece of plastic wrap, then wrap the butter in the plastic, forming a log about 1 inch in diameter. Place the butter in the freezer for 10 minutes, or until firm. 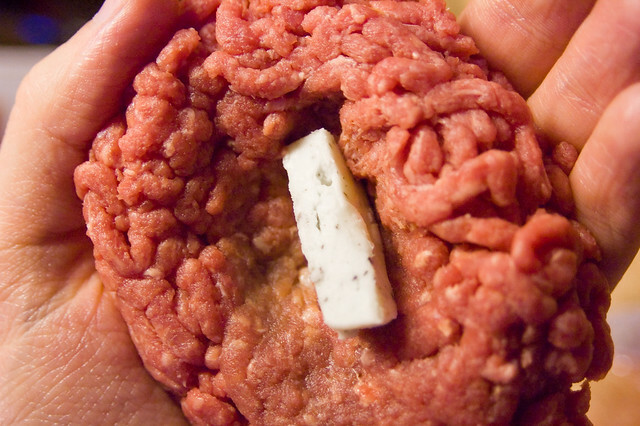 Work 1/3 lb ground beef into a patty and create a dimple in middle using you're thumb. Place 1/2 tablespoon of the butter mixture into the dimple and reform the patty around the butter. Season the outside of the patties with salt and pepper to taste. 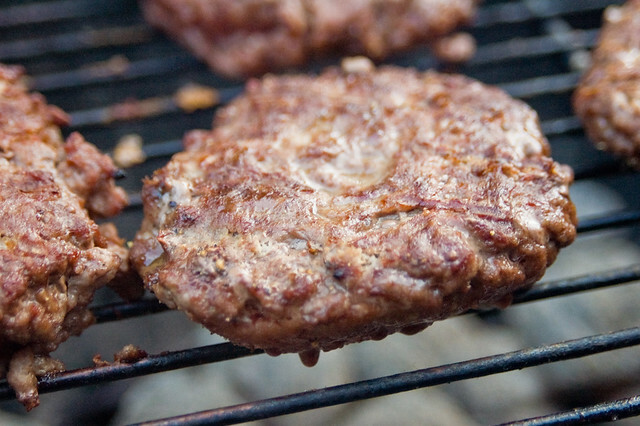 Grill the patties over a very hot grill until they're nicely browned on both sides. Remove from the grill and allow to rest for a few minutes before serving. Just realized I bought 97/3 by mistake. You just saved the day!